Holy WOW!! It's been FIVE YEARS since the very first What's On Your Workdesk Wednesday was posted! That's 260 weeks of Wednesdays, 260 weeks of peeking at what's happening on the desks of fellow crafters, and 260 weeks of getting to know amazing bloggers and crafters from literally ALL over the world. Happy anniversary WOYWW and congratulations Julia! We love you and love what you've done to build this wonderful community of crafters. Thank you. On my desk this week is the very beginnings of a new venture for me...pocket pages. I have a couple of kits I picked up from various different places, but I've shied away from it until now, because I just don't know much about it. It seems like it's so easy that I think I'm missing something. Then a couple of weeks ago, I started a smaller book as a gift for my daughter and her fiance, and I was surprised at how quick it all came together! 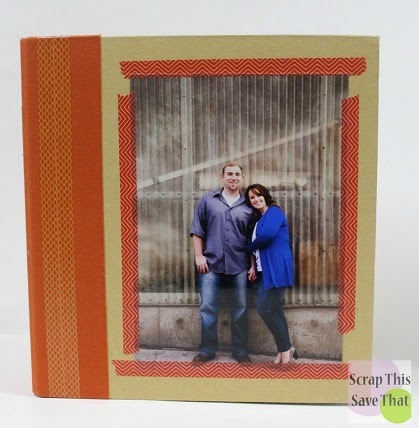 I found one of their engagements photos that went well with the orange spine on the book, and then just embellished a little with two different shades of washi tape. I plan on posting the rest of the photos of the book and saying a few more things about it in a day or two, so stay tuned if you're interested! For those of you who like to search, the WOYWW button.badge is located in the first pic above. Let me know if you find it!! I was the same Amy, and now, if it's a big 'thing' that I want to record in my scrapbook, I have a couple 12" LOs and a pocket page to add in extras, specially journalling. Works for me, but it's not in the PL category! Such a sweet picture for the front of the bridal book - will call by to see more for sure. Can't find the badge...but love all the stuff you're working with, could easily come play at your place! Happy 5th WOYWW anniversary xo Not tried the whole pocket page thing YET, but do have a prima album for it, just a matter of getting started, looks like your off to a good start.. p.s I found the badge 'sticking' out! I'm in awe of pocket pages. I am not sure I've seen anything like them before. I also found the badge, but it took me a minute or two. Happy, happy 5th Anniversary from #22. I've not heard of Pocket Pages. This is not something that I have embraced and don't think I will. I did scrapbooking for year and something happened and I have not been back, I will one day. Beautiful photo it says a lot. Thanks for sharing. I love being part of WOYWW...the friendship and sharing is just the best! WOW!! Congrats to you!!! 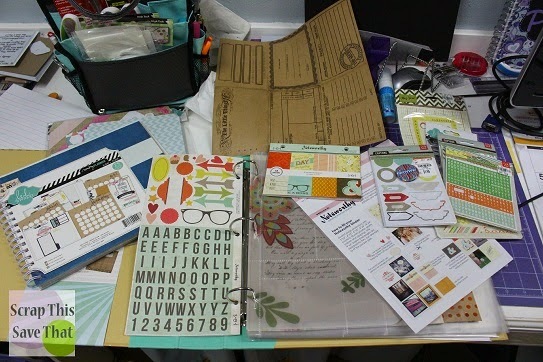 I have 2 scrapbook which I have not completed yet but I will. Yours is fabulous!! Sweet picture. Dropping by to greet you a very happy 5th WOYWW anniversary! Those pocket pages do seem a lot easier than making whole scrapbook layouts. I only have pocket pages for my ATCs.